Plants loosely cespitose, sometimes rhizomatous. Culms 30-100 cm tall, 0.5-2 mm thick, sometimes glaucous. 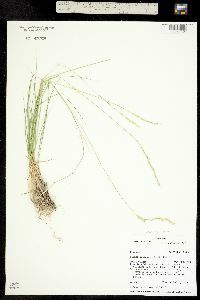 Ligules truncate, 0.1-0.4 mm on the lower leaves, 0.2-0.4 mm on the upper leaves; blades 2-6 mm wide, involute when dry, flag leaf blades strongly divergent when dry, abaxial surfaces smooth, glabrous, adaxial surfaces scabrous or hirsute. Spikes 8-15 cm long, 3-8(10) mm wide excluding the awns; middle internodes 7-20(25) mm, glabrous, scabrous on the angles. Spikelets 8-22(25) mm, with 4-9 florets. 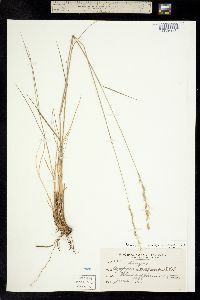 Glumes 6-13 mm long, 0.9-2.2 mm wide, about 1/2 the length of the spikelets, glabrous, sometimes scabrous over the veins, acute; lemmas 9-14 mm, unawned or with a terminal, strongly divergent awn, awns to 25 mm. 2n = 14, 28. Pseudoroegneria spicata is primarily a western North American species, extending from the east side of the coastal mountains to the western edge of the Great Plains, and from the Arctic Ocean to northern Mexico. It was also collected by Farwell in Keenewaw County, Michigan in 1895 (Voss 1972). It grows on medium-textured soils in arid and semiarid steppe, shrub-steppe, and open woodland communities, and was one of the dominant species in grassland communities of the Columbia and Snake river plains (Daubenmire 1939, 1960). It is still an important forage plant in the northern portion of the Intermountain region. Several cultivars have been developed. Rhizomatous plants are favored in relatively moist habitats, and cespitose plants in dry habitats (Daubenmire 1960). 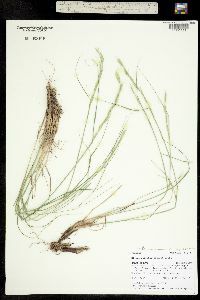 Daubenmire noted that rhizomatous plants produce few inflorescences and, possibly for this reason, are collected less frequently than cespitose plants. Daubenmire also found that awn length varies continuously within plants grown from seed. He concluded that the ability to produce rhizomes and unawned plants is heritable, that the two characters are not linked, and that the form which becomes dominant at a local site is determined by environmental conditions. The unawned phase tends to be more restricted in its distribution than the awned phase, being dominant in the native grasslands of southern British Columbia, eastern Washington, northern Idaho, and northern and eastern Oregon; the awned phase is found throughout the range of the species. Many populations include awned and unawned plants, as well as some that have poorly developed awns on some lemmas. Awned autotetraploid populations grow in mesic grassland and woodland communities of the hills and mountains of southern British Columbia and eastern Washington. Based on informal observations, plant breeders working with Pseudoroegneria spicata consider that awn presence is determined by a single major gene, and modified by some minor genes. The unawned condition is apparently dominant, as seed from crosses of heterozygotic, diploid, unawned parents gives rise to around 50% awned offspring. The above observations make it clear that the awned and unawned phases of Pseudoroegneria spicata are of little taxonomic significance, despite their evident morphological difference. If it is considered necessary to distinguish between them, the awned phase can be called Pseudoroegneria spicata (Pursh) -. L-ve forma spicata-and the unawned phase P. spicata forma inermis (Scribn. & J.G. Sm.) Barkworth. Plants with densely pubescent leaves are known from the east slope of the Cascade Mountains in Washington. Plants with nearly as densely pubescent leaves are found elsewhere in southern Washington and northeastern Oregon. Such pubescent plants may be called Pseudoroegneria spicata forma pubescens (Elmer) Barkworth. Pseudoroegneria spicata used to be confused with Elymus wawawaiensis, from which it differs in its more widely spaced spikelets and wider, less stiff glumes. The two species are geographically sympatric, but P. spicata grows in medium- to fine-textured loess soils, and E. wawawaiensis in shallow, rocky soils. 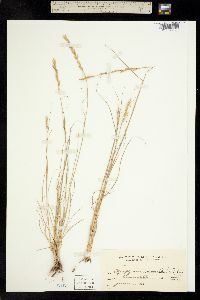 Pseudoroegneria spicata may also be confused with Elymus arizonicus, particularly with immature specimens of that species or specimens mounted so that they appear to have erect, rather than drooping, spikes. It differs in having shorter, truncate ligules and generally thicker culms than E. arizonicus, and in having a distribution that extends much further north. 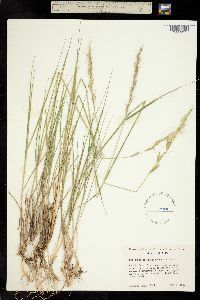 Pseudoroegneria spicata has been suggested as one of the parents in numerous natural hybrids with species of Elymus-in the Flora region. These hybrids are usually mostly sterile, but development of even a few viable seeds permits introgression to occur, as well as the formation of distinctive populations. It is often difficult to detect such hybrids, particularly if they involve the unawned form of Pseudoroegneria. The named hybrids are treated under -Pseudelymus-(p. --). Others are discussed under the Elymus parent.